Growing up my parents never tried to pretend there was such a person as Father Christmas. From as young as I recall, we knew the gifts under the tree were from mum and dad, and the man in the red suit in the shopping centre grotto was a fake, a fraud, and an imposter. 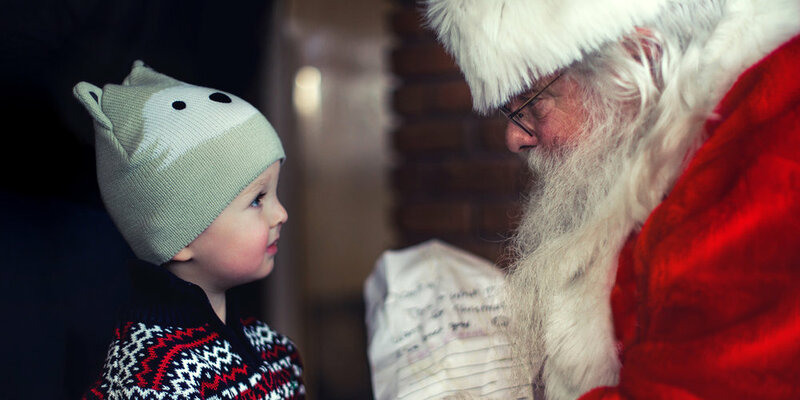 Their reason was quite straightforward: if we, as boys, thought that they could lie to us about a mythical jolly gift-giver on a sleigh, then wouldn’t we be at risk of thinking that our religious beliefs could be legends too? In other words, they wanted us to trust them in what they told us about Jesus, and not undermine their credibility as parents by weaving in strange and bizarre fantasies. I suspect many would think this is crazy for two reasons: because Santa Claus is so obviously a bit of fun that kids believing in him can do no harm, and because (it is thought) the stories around Jesus’ birth are indeed mostly fantastical in any case. There are multiple layers of irony going on here. For one thing, I suspect we’ve become more attached to the sentiments around Christmas than the historical realities the season signifies – we care a lot more about Father Christmas and his elves than we do about the religious festival. That is why it seems it is more controversial to tell kids Santa isn’t real than to tell them Jesus isn’t real. But it’s doubly ironic when we realise that Father Christmas was not, in fact, a mythical figure at all. Just a couple of months ago, news broke that his original burial site in Myra, Turkey, has likely been discovered. Saint Nicholas (whom the Dutch called ‘Sinterklaas’, which became ‘Santa Claus’) was once bishop of this town, and well-known for his generosity towards the poor. Somehow that story grew to include stockings, red suits, and reindeer – but the man himself was real. Truth and legend are often hard to separate, especially at Christmas. But while the legends are full of gooey sentiment, they are actually made far deeper by understanding the truth behind them. So, while the three kings of Orient were not kings at all, and the shepherds did not wear tea towels on their heads, the fact remains that ancient Persian astrologers and Israeli peasant shepherds were the first to discover the infant Jesus and worship him for what he was. That matters to Christians at a level much deeper than sentiment, because it showed that Jesus was not just a saviour for the Jewish people, or indeed for the privileged, but a saviour for the world (including Persian nomads) and the poor (including smelly rough-sleeping herdsmen). Strangely enough, very little of this meaning comes across at the primary school play, does it? But the danger is that, amidst the sappy and nostalgic customs, and the ever-cheapening commercialisation of this ‘Holiday Season’, people will fail to see that the reason we celebrate is because these events actually happened. To my mind, the most controversial aspect of the season is the fact that so many blithely get on with celebrating without ever really considering whether there’s some history at the bottom of all this glitz, and whether there might be power in those historical events. Second, he lived a spectacularly unique life that drew the admiration and ire of his contemporaries. This was a man who performed miracles and then tried to keep them under wraps, being averse to unwanted attention. Sane and reasonable men wrote down their eye-witness accounts of the many people they saw healed instantly by his miracle-working abilities. But, of course, like any other world-shaking figure, the powers-that-be were deeply threatened by him and eventually turned against him with fatal results. Third, he was crucified by the Romans but rose from the dead three days later. Even at his birth his own mother was told that something tragic would happen to him, when an old priest called Simeon told Mary, ‘a sword shall pierce through your own soul’. No other baby in history was born for the express purpose of dying, but then, no other baby in history was prophetically foretold centuries earlier as a Saviour whose death would change everything, whose death would bring the offer of forgiveness before the Holy God. I’ll admit that, when you conjure up in your mind the many Hallmark cards and chocolate-filled Advent calendars that depict these events, you are likely to think it all belongs in the category of Legend along with Rudolf, Dasher, and the rest of them. But as it turns out, Jesus’ followers were deadly serious about the events they witnessed and many put their lives on the line (and often lost them) so that they could relay these events to us as facts. So, I wish you not only a Merry Christmas, but one that is filled with discovery and hope. Beneath the accumulated sediment of myths and fables layered on over centuries there is something solid, something real, and indeed world-changing. The truth about Christmas is stranger and more wonderful than the fiction – and filled with more profound significance and power.